Item # 309605 Stash Points: 1,499 (?) This is the number of points you get in The Zumiez Stash for purchasing this item. Stash points are redeemable for exclusive rewards only available to Zumiez Stash members. To redeem your points check out the rewards catalog on thestash.zumiez.com. Give your hair the style power it needs with the Uppercut Deluxe Pomade Travel Tin. This four pack of tins offers ultimate levels of portability to your everyday hair styling needs. 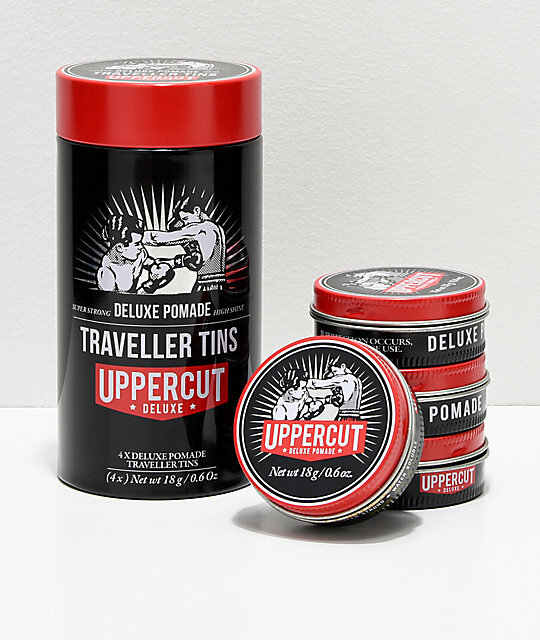 Deluxe Pomade Travel Tin from Uppercut. Contains four travel sized tins. Finish: Medium to high shine. Style guide: Perfect for controlling and defining pomps, side-parts and slick-backs. Hair type: Suitable for all hair types of medium length. Size: (4) .6 oz/18g tins.